In the world of cosplay, this one guy known as Volpin Props is king. Basically, he makes amateurs like me weep. He’s handmade countless professional-grade props and outfits from different franchises, and many of them are brought to life by Arduino. 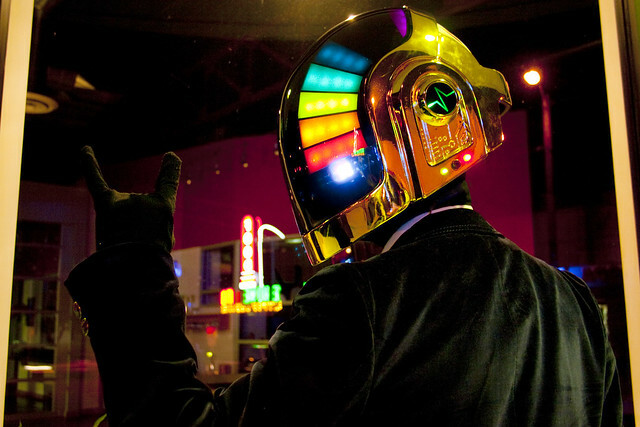 His Daft Punk helmet took him about 17 months of resin casting, sculpting, molding, and vacuum forming to make and turned out spectacularly, with the flashing LEDs modulated by the Arduino. 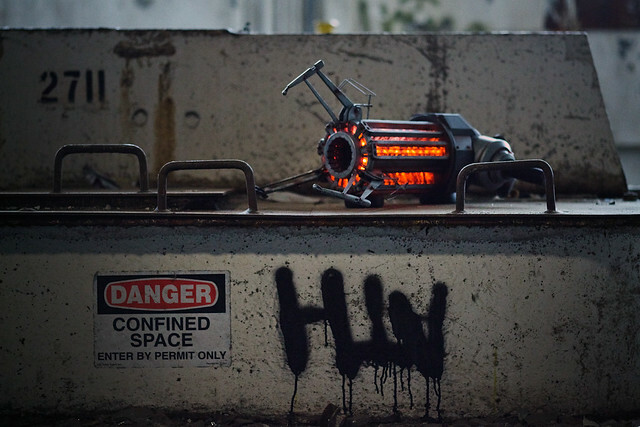 Another project of his is the Gravity Gun from the Half-Life series. Here, the Arduino controlls the pulsing orange lights on the gun. He also he used a laser cutter to shape the pieces for the precise geometry of the gun. Awesome. I’d kill for skills like that. However, I don’t think it makes the sounds and it probably doesn’t actually levitate things. The Lumibots are cute little robots with LEDs strapped to them. They roll around on a phosphorescent surface and leave glowing trails wherever the go, and they are programmed to follow each others trails until they hit something and change directions. The result is a set of complex patterns that emerge from these simple rules, along with very lifelike behaviors. Each little bot has an Arduino with light sensors and contact switches. I think they’re adorable and it’s interesting how they have a tendency to circle themselves or each other until someone else comes to bump them off track. I can definitely see them developing subtle personalities depending on their movement, and even acting curious when an outside light source such as an iPhone is introduced. This is a table(?)/surface(?) called the Monolith that has golden lights streaming over it’s surface that respond to human touch. The brightnesses of the individual lights are controlled by Arduino, while IR transmissive plastic senses when the surface is being touched. I think it’s really cool and it looks like something right out of Bladerunner. The way that people can interact with it by generating new light trails and giving them momentum is also really interesting. My only wish is that the entire surface could have LEDs underneath so that the light trails wouldn’t have to traverse only a few specific paths. Aaaah aaah I love the Volpin props guy so much! I am so jealous of his work. Have you seen the photoshoot he did in his Thomas mask? Sometimes I get this weird sad/jealous feeling from really good cosplay because I love it/the characters so much but it’s not real, so I feel tricked or something. I definitely get that from his work, that photoshoot in particular. I think the next logical step for his gravity gun build is to make a working one. You can do that with Arduino, right? I have not seen it! I should look for it. I used his Portal gun project as a reference when I was building my own and it was super helpful but also a super unrealistic goal to work towards. I’m really happy with how mine turned out but every time I see his or the NECA replicas I die a little inside. We should definitely try to incorporate arduino into cosplay! This is something I really want to make happen.